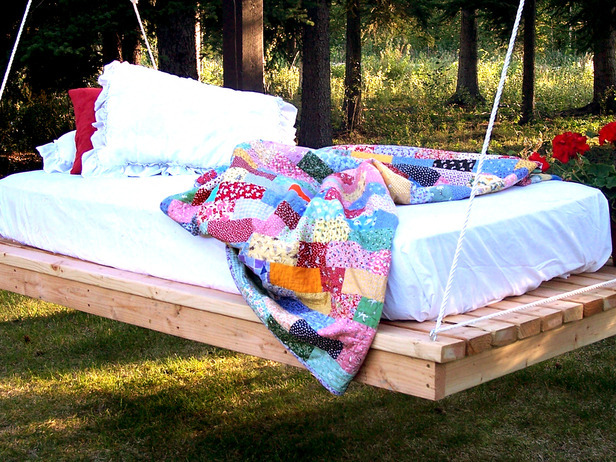 DIY How To Make A Hanging Bed: Create Outdoor Swing Bed Add to Flipboard Magazine. Dreaming of relaxing in your backyard? Here is the perfect way to create your own DIY Make A Hanging Bed. We have seen them in the magazines and now we all want one in our own backyard. Do you have the perfect place for one of these outdoor hanging beds? Somewhere in the shade hopefully. Just lay back and relax. Let the gentle winds move you to and fro. What could be more perfect? Well, besides being waited on hand and foot while you are. We know that isn’t likely to happen any time soon. Tip: Many hardware stores will make cuts complimentary with the purchase of lumber.